Are you tired of flailing around trying to sell your products online? 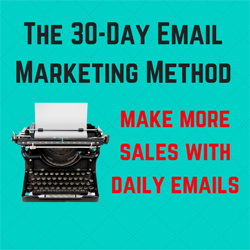 The 30-Day Email Marketing Method is a sane approach to online sales. Our 30-day email marketing method is designed to get you actually doing what you know you should be doing – communicating with your prospects every day. A lot of people know they should be emailing every day, but never get around to it. Or worse, they send out a couple and lose steam – and wind up looking like the dilettante they really are. The best approach, we have found, is to sit down and simply write a 30-day email sequence. We use Microsoft Word, on a real, old-fashioned, desktop computer. Doing it in this way gives you time to think through your premise, cover all the points of your argument for why customers should give you their money, and best of all, once you initiate it, gives you plenty of free time to work on the other aspect of Internet marketing, which is list building. It’s simple, and actually a lot of fun once you do it. But it comes down to discipline. Very few will do it – but if you are among those who do, you will reap the rewards of your discipline which is profit – as well as a sane way to approaching online marketing. Written in the style of an email sequence, this 107-page book is full of subject lines, topics and approaches to selling through email that will help you build your own campaign. We recommend reading it cover-to-cover before you begin writing. This Word document is pre-formatted with 30-pages for you to write your own email marketing campaign. Each page has built-in “tool tips” that suggest ways to write your emails. It gives you a no-pressure platform in which to strategically build your message before you launch. When you are done you can edit your campaign as we suggest and put it into your automation sequence all at once. And once you launch you will have a powerful marketing weapon converting your audience into paying customers 24 hours a day, every day of the year! You can get started writing your 30-day email marketing campaign today. P.S. Included in your purchase is a third document, titled, “Read This First,” which are your quick start instructions – definitely read it first!